In this post we will be covering how to install Cinelerra CV (Community Version) 2.3 on Fedora 27. 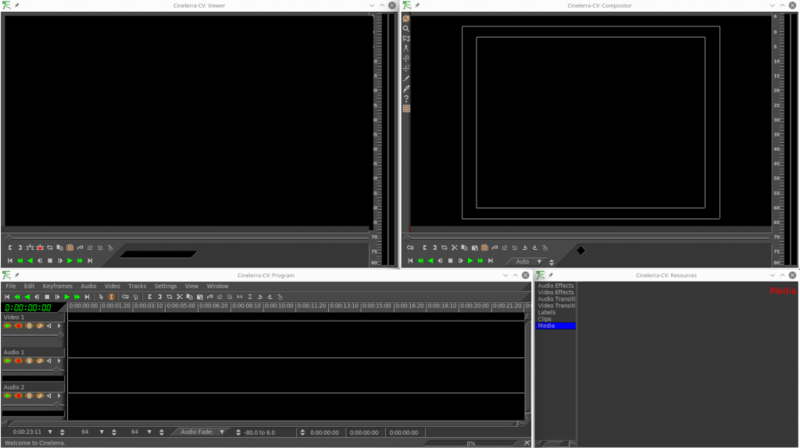 Cinelerra is one of the most advanced, open-source non-linear video editors and compositors for Linux. The version we will be installing is the Community Version. There are other versions which may or may not work with these instructions. There are several packages that will need to be installed before we can compile and install Cinelerra CV 2.3 on a Fedora 27 system. The list is fairly long but not to bad. The following packages need to be installed. Now that we have that long list done we can install them all. You can do this as a single line or multiple. Open a terminal and type the following. Wait until it completes, make take a bit. 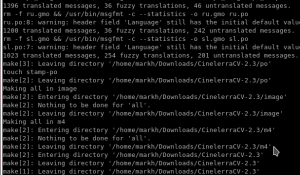 Now we can download the Cinelerra CV 2.3 source code from here. Select CinelerraCV-2.3.tar.xz and wait for download completion. Return back to the terminal and change to the directory where you downloaded Cinelerra CV to and extract the file contents. Now change to the newly extracted directory so we can start compiling and installing. First piece to run is autogen.sh which will create the configure file needed. Next step is to run configure. This command will take a little bit of time to complete. Once done we can run make. Sit back and wait, but you are now alot closer to completion. 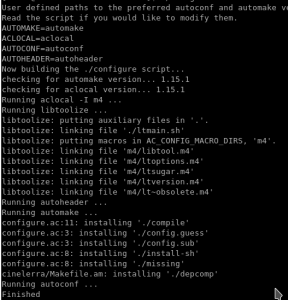 If the make command completes with no errors you will be ready to install. If there are errors you may have to install other dependent packages. No errors here, no we are ready to run make install and install it on the system. Once the installation is completed you should now be able to start Cinelerra by typing cinelerra at a terminal or a shortcut will be now in your menu ex: KDE (Multimedia > Video Editor). Now start Editing and creating Videos!. You forgot to tell us how to uninstall as an important part of installing process. Excellent tutorial (worked like a charm). I’m using Korora 26.